Going on long drives is one of our favorite things to do as a family. When Aditi was younger, sitting in the car for long hours was not something she was interested in. We figured playing games would be a good way to keep her engaged. She came up with the idea that each of us would make a game. Word games are what we come up with usually. Aditi loves to make up her own games, and sometimes they are flavors and variations of popular word games as well. One of the games we love to play is framing poetry. Each of us tries to come up with one line and the next person continues along the same lines so it is coherent. We try to use short rhyming phrases. We also discuss well-known authors and how poetry is an art of expressing what you feel. At home or even while on the move or on a vacation, Aditi and I think of certain topics that we could write poetry on. When we were driving on the pacific highway, she was very thrilled at how beautiful it is and came up with few phrases describing it, which we later used to write a small poem. She loves silly phrases and often writes a short poem to express something funny. I found that this was one of the interesting ways to spend quality time with my daughter and also make sure she appreciates art and improves her vocabulary as well. I believe poetry can be very comforting and it’s important to expose the kid to the possibilities of expressing themselves through poetry. “Listen to your heart” is one of the first poems she wrote while we were travelling. I just can't wait for you to read it. One thing that keeps Aditi engaged in creating poetry is that she also takes it on to compose a tune for it. Poetry and music are connected in more ways than what we can imagine. I’ve noticed with Aditi that it is her interest in creating a song that makes her think and write a poem. 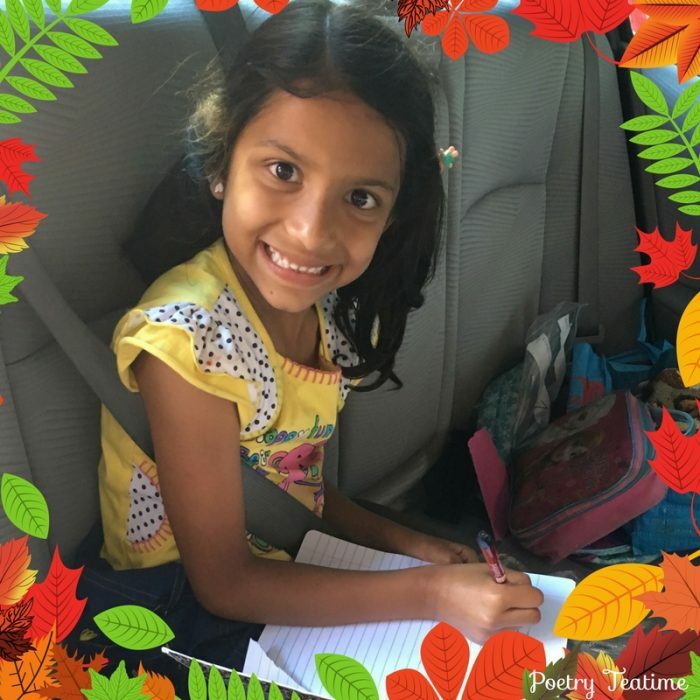 Today she came up with a poem titled “Washington,” where she expresses her knowledge of history and also how she realizes it is time that America had a woman president and that she aspires to be one. She sang her heart out, reciting this poem today during tea time at home. She performed this as a gift for her dad for father’s day. We came across poetry teatime recently and loved the ideas posted in the blog. We also enjoy reading the poems and articles on the site and it’s very encouraging for kids to see works of art by others. It is also wonderful to see how people enjoy this activity together as a family. 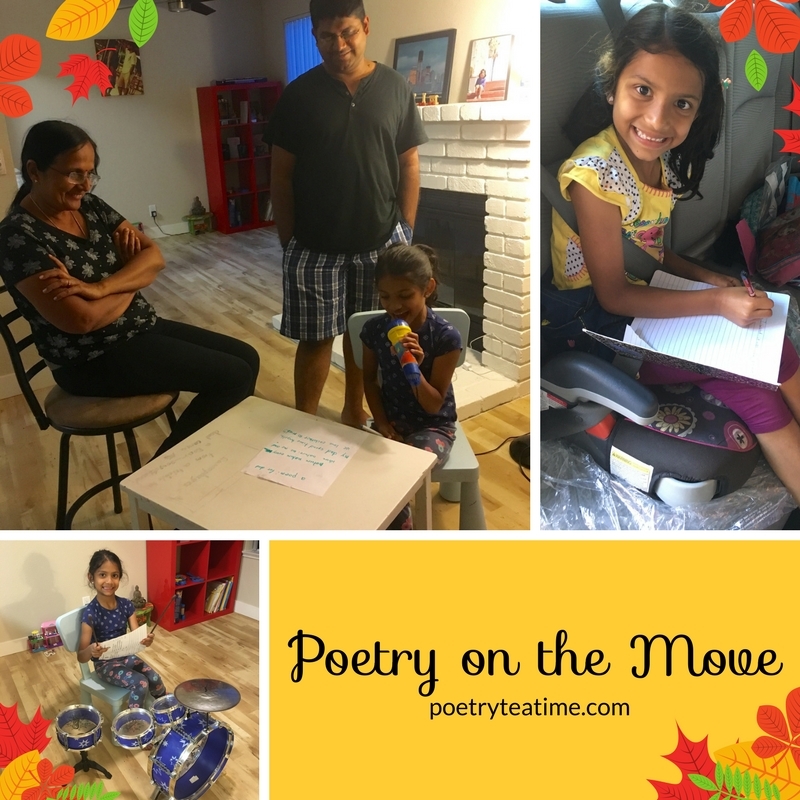 I am truly impressed about how passionate the Poetry Teatime writers are and it’s been a pleasure knowing about this blog.